As part of the wild yeast project, I need to be able to identify the yeasts that we are purifying. I’ve run the numbers and have decided to take the high tech route, as I have access to the equipment, and in the long-run, its actually cheaper than the conventional route. That said, the conventional route is worth thinking about, and a recent opportunity has arisen to show an example of this method. The high tech method will be outlined in a post in (hopefully) a few weeks. The first thing we need is info on the yeasts we are looking for. The good news is that there is a lot of info on the various taxa (groups) of yeasts & fungi. The bad news is that much of it is in expensive textbooks that can only be found in university libraries. None-the-less, some of this info can be found in free sources. An idea of the structure & biochemistry of our potential strains. Before I begin I need to give a brief biology lesson, in case you forgot your high school science class. All species of life on earth arose from a common ancestor that lived ~4 billion years ago. Since then, all life on earth has been diverging to form the various groups of organisms we see around us. Because this occurred via evolution – i.e. the accumulation of changes over time – a very specific pattern of inheritance occurs, where species that separated recently are more similar to each other than species that separated longer ago. For example, you are much more similar to a chimpanzee (95%, last common ancestor was ~6 million years ago) than you are to brewing yeast (~30%, last common ancestor 900 million to 1.5 billion years ago). As you go down that list you get ever more kinds of yeast grouped together (Ascomycota), then all fungi (including molds). Ultimately we group together everything but bacteria and archea under “Eukaryota”. Yes, that is right, you are closer to yeast than yeast are to bacteria! Why is this important? Because nearly all of the yeasts we are likely to find in our beer are going to be of the same Order; indeed, all but one of the wild yeasts you typically find in sour beers/wines are in the class Saccharomycetaceae (one one exception is Schizosaccharomyces pombe, which is of the same phylum as the rest). The desired bacteria (when they are desired at all) are even more similar, all belonging to to the same family (Lactobacillaceae). As such our methods need to be designed to separate organisms at the order (yeast) or family (desired bacteria) level – a far simpler task than dealing with phylum or kingdom analyses. Which Organisms do we Expect To Find? The particular organisms we expect to find are, fortunately, somewhat limited. This is because the conditions found in wort are not favourable to the growth of many organisms. Moreover, we are using specific sources (skins of fruit, grains, air in a home, etc) that already are limited in terms of the species which can be found on them. So by combining these two pieces of info, we can reduce our list of ‘possibles’ from the millions of microbrial species, to a handful of likely candidates. We can reduce this list even further by limiting our list of likelies, to a list that we would actually want in our beer. Our list of likely yeasts (that we want) can be derived from some free and not-so-free sources. This free scientific article outlines identifies the yeasts and bacteria found in an example of “American Coolship Ale” – AKA an US-brewed lambic. Likewise, knowing a bit of our source material can identify common species found on the source. I.E. fruit (especially grapes) are well studied, with commonly found species listed in books such as “Wine Microbiology – Practical Applications and Procedures” (partial book at google), as well as in scientific articles such as this free scientific article. The aforementioned sources also include some info on species of bacteria we may find, although the ‘desired’ list is limited to a few strains of lactobacillus & aceotobacter. Without much ado, here are candidate species that make our “desired or at least potentially useful” list. Underlined yeasts are known to be capable of fermenting a beer in a fashion that produces a palatable beverage. Underlined bacteria are ones commonly found in beers such as lambics & Berliner Weiss. Non-underlined examples are species/genus’s found in beers like lambics or naturally fermented wine, but whose contribution is not known. In cases where multiple species within a genus are listed, the individual species names are separated by a forward slash (‘/’). So we now know what we are looking for – but how do we actually identify things? We start with a book or other information source that tells us about the yeasts/bacteria of interest; specifically, one which provides information on the morphology of the organisms (ideally, both under the microscope & the characteristics of a colony on agar) as well as biochemical information (i.e. what inhibits or enables growth of the organism, processing of certain dyes, etc). Unfortunately, this info isn’t widely available for free, but the microbe wiki often has enough information. Likewise, we can also track down textbooks that contain this info – e.g. “The Yeasts – A Taxonomic Study” (partial free copy at google books). Using this information, we can begin to screen our yeasts, assessing things like source, morphology, the capacity to consume certain sugars, etc, to define the species. This requires a series of specialized (AKA ‘expensive’) defined medias, along with a lot of time and patience. But, eventually, we can narrow down our purified strain of yeast or bacteria to the genus level – species identification is also possible, but generally very difficult to achieve. I’m not going to go through all the strains of yeast in detail, but as one example we can separate Saccharomyces from most other species of yeast by assessing their ability to grow in the presence of the antibiotic cycloheximide and their ability to process the dye bromocresol green. Saccharomyces (and several other yeasts in the family Saccharomycetaceae) are killed by cyclohexamide. But unlike most of the Saccharomycetaceae, Saccharomyces cannot process bromocresol green. So we can grow an isolated strain on two yeast-media plates; one containing cycloheximide, the other bromocresol green. If we don’t get growth on cycloheximide, and we get green colonies on the bromocresol green plate, we probably have some form of Saccharomyces. Brettanomyces, by comparison, grows on cycloheximide and will process bromocresol green, thus producing white-ish yellow colonies. As you can imagine, identifying the numerous genera and species of yeasts and bacteria requires a large library of specialized plates in order to identify the yeasts we have identified. This example arose before expected, due to a conversation over at Canadian Home Brewing Forum. The user Doc_Drive (whom, through an amazing coincidence, is a former soccer-mate of mine and my brothers brew-buddy) has isolated a strain of yeast from some apples he had left outside over the winter. All he had was a picture, but luckily, the yeast were unique enough that I could make a tentative identification. He’s offered to mail me a plate of the yeast, to which I’ll use the high tech method (thread coming soon) to confirm the ID. 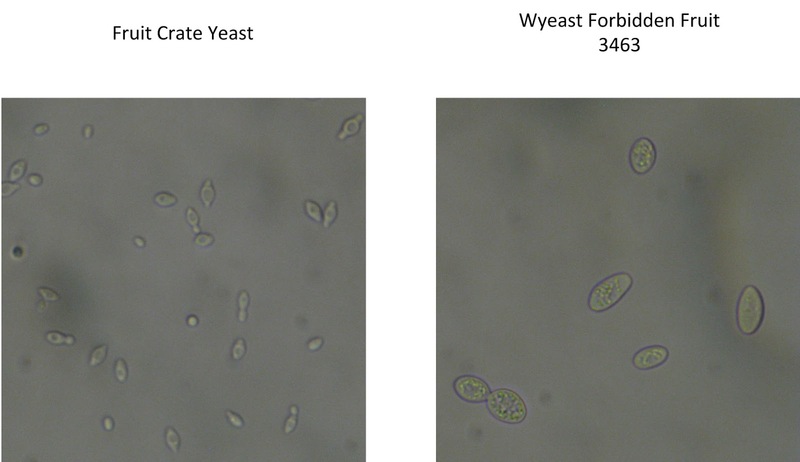 The picture is below, showing a side-by-side of the new yeast vs. a conventional Saccharomyces brewing strain. Wild (fruit citrate) yeast compared to a Wyeast ale yeast. Click for full-sized image. This yeast is morphologically unique – it is small, on average 1.2-1.8um long (compared to 5-8um for Saccharomyces). It buds from the terminal ends, producing lemon-shaped yeast, and has a large vacoule (circular shaped structure observed mid-yeast). These characteristics are particularly notable in the upper-right hand yeast. Moreover, a fermentation test revealed that this yeast isn’t overly alcohol tolerant, with its main phase of fermentation crapping out at 2% by volume. Based on these features we could say that it wasn’t Brettanomyces (too small, plus Brett buds in a way which forms “mickey mouse” structures), Saccharomyces (too small, too oblong). Likewise, the shape and large vacuole makes identification as Candida, Zygosaccharomyces, Pichia, Aureobasidium, Torulaspora, Kluyveromyces, Rhodotorula or Schizosaccharomyces unlikely. That’s nice, but there are a million other things it could be. . .unless we take into account that it came from fruit. This limits our list of likelies to the earlier list. Based on its morphology, fermentation capabilities, and source, this yeast is likely Kloeckera apiculata (AKA Hanseniaspora). This is a not uncommon yeast in the early stages of natural wine fermentations, and imparts a fruiting/floral/citrus flavour – exactly what Doc_Drive described after his fermentation test. Timetree – Source for identifying evolutionary time between two species. Brewhouse-Resident Microbiota Are Responsible for Multi-Stage Fermentation of American Coolship Ale – Free scientific article on the yeasts/bacteria found in lambic-style beer. WINE MICROBIOLOGY- Practical Applications and Procedures (partial free e-edition) – Book covering many of the species of yeast found on yeast, as well as some useful lab methods. Link is to a free, but partial, copy at google books. Profiling the Yeast Communities of Wine Fermentations Using Terminal Restriction Fragment Length Polymorphism Analysis – Free scientific article on the yeasts/bacteria found in naturally fermented wine. MicrobeWiki – Wiki-style database of many microbes, including some of the detailed biochemical information required for designing identification experiments. The Yeasts – A Taxonomic Study. Book with all the technical information required for microscopic/biochemical identification of yeasts. Link is to a free, but partial, copy at google books. Sounds good; you have incredibly cheap mass-spec! In my hands, the sequencing looks to be about $8 per sample; maybe less as I'm now manufacturing my own Taq. I was talking about MALDI-TOF spectra (mass spec data). In this case, you basically collect the mass spectra of a whole organism and compare to libraries. Unfortunately, the mass spec library available at this facility does not include any wild yeast strains. And such libraries are not freely available (they are really expensive). I would therefore have to make my own library with reference strains first. And I don't have any reference strains right now. But if reference specs are available, MALDI-TOF would be a rather cheap (around $10 a sample) method. Your facility doesn't need to have all of the reference info on hand – there are free databases (I link to two in my sequencing post – NCBI and the fungal genome collection). Simply take your sequence and run it through there; even if they don't have the exact species, you should be able to match to at least genus. I am still waiting for a sample of the Kloeckera (assuming that is what it is), so its not in the current batch being sequenced. Right now all I'm sequencing is a Brett L, Bret B and good ol' 1084 (irish ale). The method I'm using is reported to work for all fungi, so I have good confidence it'll recognize any yeast anyone throws at me. thanks for your reply. Cycloheximide and bromocresol green and ethanol as only c-source seem to be fairly Brett-specific. However, I kind of expect there are a lot of Brettanomyces strains not able to grow on such a agar media as well. I still want to screen all my wild yeast for bromocresol depletion. But this is quite labor intensive. That's why I am still reading through a lot of yeast sequencing papers to see if sequencing might be a better way to go. RFLP might work as well to tell at least some yeast species apart such as Brettanoymces from Saccharomyces. I would prefer to send my samples to a local MALDI-TOF facilty which is cheaper than sequencing (for me). Unfortunately, they do not have reference spectra for most of the wild yeasts out there. Concerning the sequencing, did you sequence the wild (fruit citrate) yeast as well? I would be interested to know if this yeast is Kloeckera apiculata. I have some yeasts with a similar morphology (lemon shaped). Thanx Sam, I've been keeping up on your blog and was familiar with your results. The short-lived nature of bromocresol green is pretty well known; oxidation and pH changes can deplete it pretty quickly without involving yeast metabolism. Its great short-term, but not long-term. No detection reagent is perfect, which is why most characterizations require multiple tests (i.e. cycloheximide + bromcresol is fairly brett-specific). I'm hoping the sequencing stuff can simply bipass all of that – I have some test samples in right now, so hopefully the final results will be up later this week. If you're ever interested, we could arrange a trade/etc and I could sequence up your strains. Very cool blog of yours. I kind of wonder why it took me so long to find your blog. I am especially interested in all sequencing based methods since I now have a bunch of different isolated yeasts which I would like to identify. Will read your sequencing post soon. I just want to add that one has to be very careful with bromocresol green. Bromocresol green is widely discussed but not a lot of results showing its potency are published. I therefore did a screen (http://eurekabrewing.wordpress.com/2013/02/13/saccharomyces-bromocresol-green-screen/) and bromocresol green is only useful in a short time frame and there are Saccharomyces strains capable of depleting the bromocresol green. Which would lead to false positive results. I will; hopefully the next episode of the wild yeast thread will be out in a week or so. Plus, brew day this weekend!